The top scientist behind the 500-page report released Oct. 23 delivered the most poignant response to the White House gag order. John King, professor at the University of Rhode Island Graduate School of Oceanography, said the idea of excluding climate change from the report is “completely irresponsible.” If it goes unchecked, “It’s going to undo everything we’ve done so far and much more than that." King dissected EPA administrator’s Scott Pruitt’s assertion that scientists are politicizing climate change. “When you censor science, you take it from the sublime to political at lighting speed. He did that. We didn’t do that,” King said. After the Oct. 23 health of Narragansett Bay event at Save The Bay, Sen. Sheldon Whitehouse, D-R.I., spoke of EPA's removal of references to climate change on the federal agency's website and “a ridiculous exercise” to cast doubt on decades of scientific research that proves global warming. “It’s just a constant effort at trying to silence conversation about climate change,” Whitehouse said. “It makes me feel a little sick to my stomach, frankly, that that would happen in the United States of America." He said the motivation for the fake climate denial is to protect the fossil-fuel industry. Limiting that effort is the Senate's success in protecting funding for the national estuary research program, the EPA, and the National Oceanic Atmospheric Administration. Whitehouse said sharp criticism of the Trump administration during an environmental conference at the Rhode Island Convention Center on Oct. 20 — the same day Trump-appointed EPA officials pulled the scientists from the Oct. 23 estuary forum — wasn't the reason for the gag order. “Once they figured out in Washington that these guys were going to talk about climate change they shut them down. That’s my guess,” Whitehouse said. During the recent press event, Rep. David Cicilline, D-R.I., said the 2017 Narragansett Bay report was one of the largest and most vetted pieces of scientific research ever. Support for the research was bipartisan. Director of the Massachusetts Department of Environmental Protection, Matthew Beaton, attended the event to highlight the fact that 60 percent of the Narragansett Bay estuary is in Massachusetts. He praised the multi-state effort to study and clean the watershed. 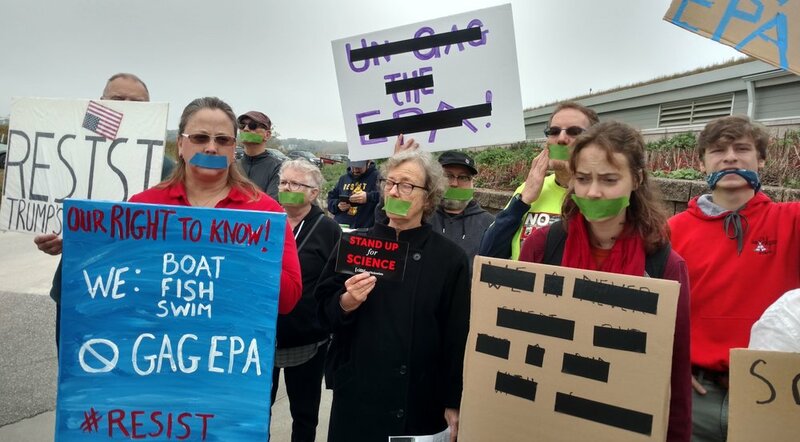 A group of about 40 activists organized a protest outside Save The Bay headquarters after learning of EPA’s gag order late on Oct. 22. “With hurricanes, with fires, with droughts, with floods, it's just the wrong time to be shutting down the science," said Justin Boyan, an organizer for Climate Action RI. "What we actually need is politicians to do something to stop polluting the atmosphere." About 20 Brown University students joined from the RI Student Climate Coalition at the protest, as did other protesters who oppose the fossil-fuel power plant proposed for Burrillville and the proposed LNG facility on Providence's industrial waterfront.